A Case of Spontaneous Combustion from 1916? 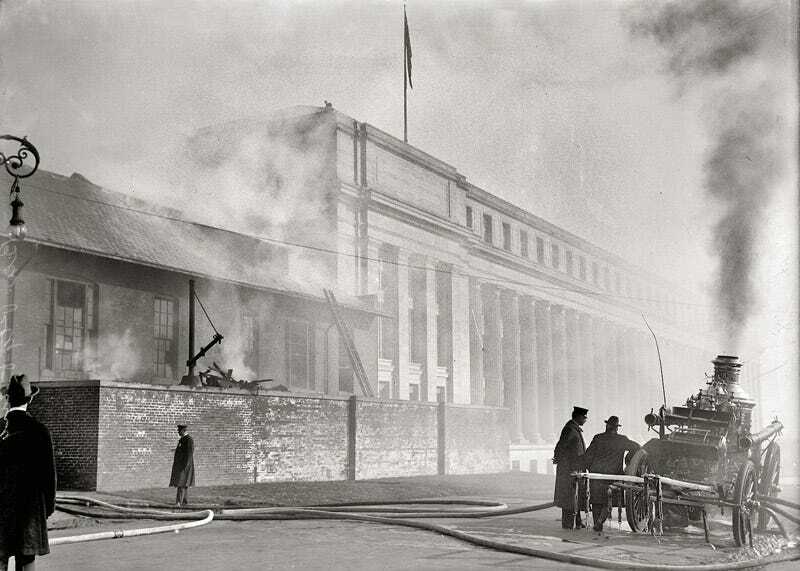 This photograph from 1916 is of a fire at the Treasury Dept. 's "Bureau of Engraving and Printing," presumably in Washington, D.C. Mysteriously, however, whomever labeled it described the fire as "spontaneous combustion." We may never be sure what our anonymous archivist really meant by that. Perhaps an engraver suddenly burst into flames, setting the whole building on fire. Or maybe the building itself suddenly caught on fire for no reason. Either way, Dave posted this intriguing image on Shorpy (above), and a commenter noticed that it looked like this (below) present-day intersection in D.C., on Raoul Wallenburg Place.